13 condos sold in Ormond By The Sea Florida during May 2018 through the Daytona Beach Area Association of Realtors® Multiple Listing Service (MLS), none of which involved a lender as a short sale or foreclosure. There are 15 condos under contract awaiting closing. The 13 sales is the same number as last year. ​Here is the list of the Ormond By The Sea Florida Condo Sales for this month. 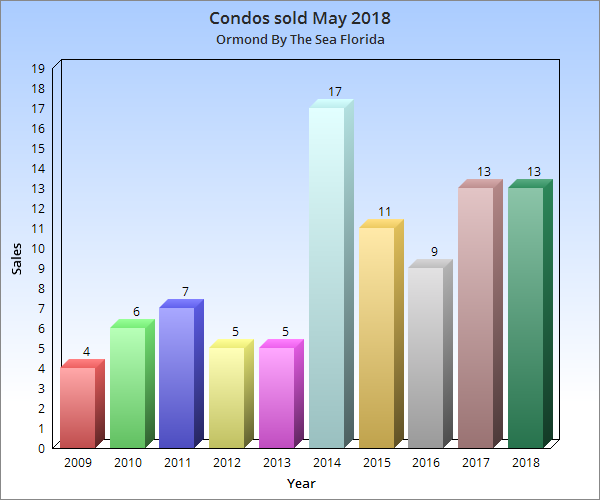 Graph of Ormond By The Sea Condo Sales showing 2018 compared to previous years for this month.